What do you mean it was an afterschool project? We wanted to make something fun after our usual workday had ended. Okay. Put another way, it was our secret project. (laughs) That was how it began, but at first we hadn't decided exactly what we wanted to do. 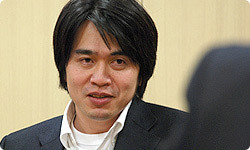 But Shimizu-san had been saying for a long time how he wanted to create some kind of network. So we tried out a number of possible network projects for Wii, but nothing came together well. Then at some point we changed direction and decided to give the Nintendo DS a shot. Shimizu-san drew a picture on the Nintendo DS and made software for displaying it on Wii. He really likes drawing. I'm not very good at it, though. His pictures have a distinct style. When I saw them, I knew what I wanted. I said, let's use this to make flick book animation, and two days later, it was done. Then we started chatting, and we wondered, since the Nintendo DS has a mic, if we could add sound, and the next day he had done it. This software's prototype had been completed in just a few days. Work moves fast when you're working on something you like (laughs). I suppose we knew exactly what we wanted. That's why it went so fast. Koizumi had only told me a little about it, but I thought it sounded great. Then before I knew it, I was working away on it! I wanted to surprise Koizumi-san. I'm a little mischievous that way. We thought it would be a waste if we didn't show it to anyone. Early in April of 2008. At the time, we thought we'd call it Flipbook Workshop. You could make flick book animation and enjoy watching it. But one day one of the programmers rejected it by saying he had nothing to do with flick book animation. Since he'd never drawn flick book animation, he didn't think he ever would. Exactly. But he said it was fun watching ones that others had made. Looking back, I can see that Shimizu-san was originally making this software for himself so he could take notes. That's right. I wanted a tool for recording notes. The prototype had been a toy for drawing, but couldn't keep records. That's why on the train one day I realised that we had to make it into a notepad that anyone might use to write down notes and share them with others or keep them for themselves. 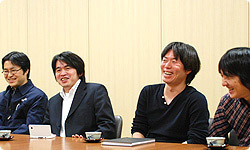 When I got to work that day, the first thing I did was say to Shimizu-san that we should call it Ugoku Memocho (moving memo pad) - or Ugomemo for short - rather than Flipnote. Do you remember? After that we thought about allowing you to exchange what you'd made using Flipnote with your friends in front of you using Nintendo DS's local communication ability, but we realised that alone wasn't enough. 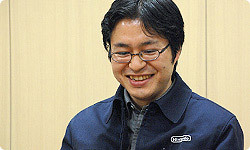 The software Shimizu-san had originally made connected Wii and DS and displayed lots of notes all lined up on the Wii screen. The Wii console took the place of a network server, allowing data to be exchanged with the Nintendo DS. We talked about making it into WiiWare3, so if you connected to the network you could exchange notes with lots of people, not just with your friends. At the time, we didn't know anything about the Nintendo DSi. 3WiiWare: Non-packaged software exclusively for Wii. It can be purchased and downloaded via the Wii Shop Channel. Only a few people within the company knew about it at that time. The first thing we thought of was using the Nintendo DS download feature to put a WiiWare art tool into your Nintendo DS. In other words, you would download Flipnote Studio, and then return your creations to the WiiWare tool and save them. Then we talked about making something like a bulletin board so you could share your saved notes with lots of people over the Internet using Wii. About that time, Takashi Tezuka came on a business trip from Kyoto. That was when you first heard about the Nintendo DSi. Right. We realised the Nintendo DSi was perfect for what we were making. What did Tezuka-san say about that? At the time, our project was merely in its trial stages. He said that if we didn't hurry up and give it to the world, we would miss our window of opportunity. Tezuka-san probably sensed that it was different from other products. He came to me to discuss enlisting the cooperation of the Network Development Department. When it came to making your own notes and enjoying them, I had faith in Flipnote, but some people, like the programmer I mentioned, simply enjoy looking at what other people have made. So in order to have lots of people enjoy themselves, I thought we definitely needed something like an Internet bulletin board. When I heard about that, I thought we wouldn't be able to release Flipnote Studio until the latter half of 2009, because the Network Development Department's schedule was crammed full of other projects far into the future. I thought it would take forever for Nintendo alone to construct a system including a server. I remember you thought long and hard about it, and then suddenly jumped up. Then, after thinking about it some more while standing up, you sat down in your chair backwards, with your arms wrapped around the seat back... (laughs) Then, as if you'd just had a flash of inspiration, you said, "We'll work with Hatena." I think a lot of ideas in your head suddenly connected. I've met Mochio Umeda4, an external board member of Hatena, about three times, and their research and development team had moved to Kyoto, so I thought if the chance ever arose we could make something interesting together. Our Network Development Department was forming a loose connection with them, but I thought it would be boring if it didn't amount to anything more than a casual business acquaintance. I kept wondering if we couldn't do something ground-breaking. Just then this new project dropped into my lap, and all these random bits in my head came together. 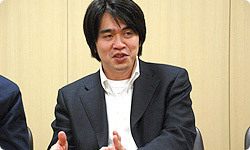 4Mochio Umeda: Bestselling author of Web Shinkaron (Web Evolution Theory). President of MUSE Associates and Hatena board member. 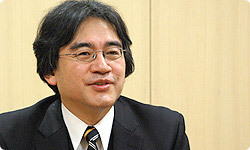 Shigeru Miyamoto always says that a true idea is "something which solves multiple issues at once" and I thought that this was just such a moment. That was quite a sight!